When it comes to jazz music, I currently consider myself a complete novice. However, some of my favorite songs contain "jazzy" types of chords and sounds which I really enjoy hearing. 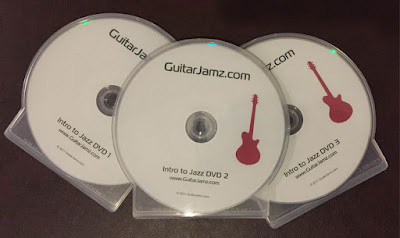 So, I didn't quite know what to expect when I began the Intro to Jazz DVD Course from Marty Schwartz and GuitarJamz.com. Marty Schwartz, a wonderful and talented guitar teacher with over 1 million subscribers on his YouTube channel, said that he does not consider himself a jazz master. However, in this DVD course, he tries to condense his years of experience into understanding the essential basics of jazz. The knowledge, once applied, can then be used in all different styles of music such as blues, funk, latin and pop. Who is this 3 DVD set for? If you are a beginner guitarist and want to learn the fundamentals of jazz in order to get up and running quickly, I think is a terrific introductory course. Marty covers the three popular jazz chord categories - Major, Minor and Dominant, showing you lots of examples and progressions that you can start using right away. What I found really interesting and helpful were the 251 progressions. Marty shows you where these chords are located on the E and A string roots and gives you lots of variations and embellishments you can use to add extra flavor to your playing. There are major 251's and minor 251's and once you become familiar with the guitar fretboard you can start to see how patterns emerge. I enjoyed practicing the "pop" progressions examples and using these jazz chords as replacements where I would typically use only a major or minor chord. This subtle sound difference can really enhance a piece of music and expand your overall chord knowledge. In addition to the jazz chords and progressions, Marty's Intro to Jazz course also teaches popular jazz riffs that can be added as an extra layer on top of the basics. The DVD's contains lots of great content, but unfortunately I wasn't able to grasp all of these licks first time around. However, I love that I can reference this material over and over again on my laptop. It takes time to develop a musical vocabulary, and I now feel jazz is an important style to learn as a guitarist. I thoroughly enjoyed going through this course, even though I'm not a huge fan of jazz music. What I found to be very useful was learning about the 251 concept and the jazz chords that make up a specific key. The chord progressions and many of the riff examples were also fun to discover! With practice, I can see how I can incorporate alot of this knowledge into my songwriting and overall guitar playing. If you're a jazz guitar beginner or want to have a better understanding of the fundamentals, then I suggest trying Marty's Intro to Jazz DVD course! Are you ready for an introduction to jazz guitar with Marty? Click here to purchase Marty's Intro to Jazz DVD course from GuitarJamz.com! Have you purchased Marty's Intro to Jazz DVD set? What did you think of this content? Please share your feedback with us in the comments below? Marty offers other programs as either Value Bundle sets or as individual DVD's and CD's.